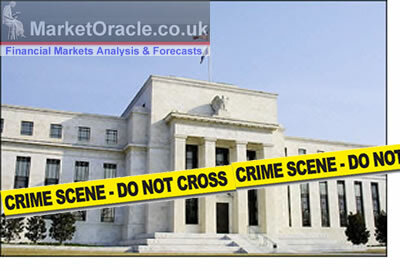 Shah Gilani writes: Ben Bernanke is the don of the greatest criminal enterprise in the world. And yesterday his made monsters, the Five Families, lined up to kiss his ring, again. By not "tapering" or reducing the $85 billion a month ($45 billion in Treasuries and $40 billion in agency mortgage-backed securities) the Fed is buying from banks, the Fed is saying to its hit men, "We are family, and as long as Johnny Law is coming after you, we've got your back." The "legal and litigation costs" (that means lawyers and fines) racked up by America's Five Families since the credit crisis gently (not) ushered in the Great Recession is over $103 billion, by some estimates. That doesn't include actual losses from related activities. The Five Families, according to the Federal Reserve, are big, very big bosses in their territories, which means America and a good part of the world. Let's name names... and then I'll tell you the REAL reason the Fed didn't taper yesterday. That's a lot of muscle. Let's look at just JPMorgan's rap sheet, because it's fantastic (as in I can't believe it) and sickening to me. While JPM has spent some $16 billion in legal expenses and some $7 billion in fines (oh wait, add another $920 million in fines as of this morning for the Whale tale they told regulators...) related to the financial crisis, since the end of 2007 through the first half of 2013, it has also paid out $23.9 billion in dividends to common shareholders. Now, don't get me wrong. The bank isn't technically guilty of any of these misdeeds (crimes?). So just because they may be accused of things or may have paid fines related to some of this stuff, or will pay fines, or will keep on keeping-on paying legal and litigation costs on account of the myriad "other" cases being brought by government gumshoes (SEC, CFTC, OCC, FBI, Justice Department, State Attorneys General, Federal prosecutors) and class-action lawyers, and ma and pa investors everywhere, they've neither admitted nor denied anything. This stuff is all "alleged," got it? This list is off the top of my head, so please feel free to chime in on anything I missed. Hid massive losses on mortgage securities by creating off-balance sheet "conduits"
That's off the top of my head. What else do you all have on them that I've forgotten? Now, I'm not calling JPM a criminal enterprise. It's a bank. But if it was a criminal enterprise it would be one helluva bank. You want to know why the Fed didn't taper yesterday? Because the banks need more money, and the Fed's stimulus QE program is all about pumping up the banks' balance sheets. Is that so they have money that trickles down to consumers who might want or need loans? Because the banks in the criminal enterprise system are spending billions on litigation and fines, and on top of that, they have to have plenty of money, cash, to pay common holders fat dividends. Why? So their stock prices go up, so their bonus pools get bigger, so they can hire more smarter people to generate new schemes to rip off more consumers and businesses and governments. That's what yesterday was; it was a ring-kissing ceremony. And you thought it was a press conference... silly you. Next: Shah Shows You How to Make 455% by "Bubble Watching"